Google’s instant search results are a great timesaver when you’re searching the Web, but wouldn’t it be useful if the feature was rolled out to other services like Gmail and Apps too? CloudMagic is a handy little utility for Chrome and Firefox that, from today, does just that. Once installed, you just connect CloudMagic to your Google account and it’s ready to use. You’ll now find a new text entry box in the top right-hand corner of the screen whenever you’re in Gmail or Google Docs. Simply start typing and, just like Google Instant, a menu of results will immediately start to appear, changing as you add or remove letters from your query. 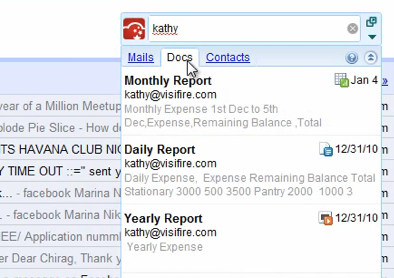 Email, documents, spreadsheets, presentations and contacts are all supported. Click on a result and a pop-up preview appears, allowing you to see the email or document without having to actually open it up. If you feel like there’s not enough space in the pop-up interface, you can break the search results out into their own browser tab, too. While the name CloudMagic might imply that the service is keeping a search index of your mail and documents online somewhere, the developers tell me that everything is actually stored locally on your machine. This means that there’s no need for any security concerns. In future, the India-based team plans to develop a mobile version of CloudMagic, along with support for Twitter and Facebook. They also intend to target the enterprise market with support for services like Salesforce and Office365. For now though, anyone who lives their life in the Google cloud should find CloudMagic a real boon. You can install CloudMagic for Chrome and Firefox here.